Is This Another Anemic SE Amp? The Vaic room at CES 2001. The Vaic Reference 52B Monoblock amplifiers are flanked by the Lumen White Loudspeakers. The amp between them is Vaic’s Model 32B Stereo amp. With a minor change, the Reference 52B Monoblocks may use the 320B or 620B tubes providing 40 or 60 watts respectively. Initially, Acoustic Dreams is only introducing the 520B, 50 watt version. Also in the pipeline are several Vaic stereo amps. Is the Vaic Reference 52B Mono just another SET (Single-Ended Triode) amplifier capable of driving high efficiency speaker systems, 98dB or higher, and not much else? Hell no, this is not another pair of anemic, single-ended monoblocks. These amplifiers are quite capable of driving my 89dB Piega P10 with plenty of power. There have been quite a number single-digit-to-20 watt amplifiers over the last several years, but there have also been a few exceptions – Cary and KR Enterprise come to mind. Even some of the exceptions, SET amps with higher available power, are not quite capable of providing the kind of tight bass and dynamics most of us crave. Amplifiers that use conventional, triode output tubes can provide plenty of voltage for speakers but not much current, and yet most speakers want current to drive them at their best. That’s why so many of us reject tube amps in favor of transistor amps, that and the perception that tubes weaken over time while transistor amps don’t. Jim Aud (of Purist Audio) told me several years ago that he had conducted some tests that indicated that components in transistor amps also weaken over time. Enter Alexis Vaic and subsequently Riccardo Kron of KR Enterprise who began to manufacture a line of triode output tubes that incorporate new technology, providing not only high voltage but also relatively high current – in a way, the best of both worlds. For the most part, these tubes are hand-made and thus are relatively expensive, but this is quite appropriate, since such costly development and technology (a significant departure from nearly all other triodes that are either "new old stock" or copies of triodes developed more than fifty years ago) has led to the design of a new breed of amplifiers from Cary, KR, Vaic, etc. Early on, the new tubes gained a reputation for being unreliable, and some time passed before the source of the problems were identified. But since then, their manufacture has been stabilized. I have not heard of any problems in quite some time. In fact, I have been using some of these new triodes for several years without any significant problems. Those of you who have followed my reviews in The Audiophile Voice and Stereo Times know that Vaic Monoblock Amplifiers are not new to me. Over four years ago, I reviewed Vaic 52B Monoblocks in TAV and was overwhelmed with the quality of the sound from the SE review pair, each of which used one 52B output tube in each amp providing about 30 watts per amp. About the same time Harry Pearson reviewed the amps in TAS (issue 106) and was similarly impressed. About six months later, I became the proud owner of the final, updated production models (later a set of 52BX tubes was also supplied), which have been operating since then, with the exception of the replacement of a Mullard CV 378 rectifier tube. (The amps also operate with 300Bs together with a change in bias!) Clement Perry later borrowed the amps for a couple of months to use with his Van Schweikert VR6 Loudspeakers – a near perfect match between the efficient 96 dB speakers and the Class A, SET amps with zero feedback. I don’t think Perry ever got over that beautiful combination. Each mono operates in parallel, single-ended Class A mode with zero negative feedback. While each of my 4+ year-old 52Bs with a single 52B outputted to about 30 watts, the new Reference 52B Mono output 50 watts per channel. Each 121 lb. amp has two inputs, one RCA and one XLR. Input impedance is 55K Hz; output impedance is 2-8 Ohms; source impedance (unknown at this time) depends on the output impedance. These handsome amplifiers are beautifully built with stainless steel, dark rhodium colored canisters and wood side panels. Vaic claims unique output transformers with no cost spared in the selection of components. Another unique feature of the amps is the pure simplicity in setting the bias. There is a red LED window behind the transformers; a switch selects from the two output tubes with adjustment screws located on the top plate. There is no adjustment for matching the input sensitivity for each of the monos. Ordinarily, the monoblocks would be delivered with the inputs matched, but in case one of the amps had to be replaced for whatever reason, the sensitivity of one compared to the other might be slightly different. This certainly is a minor problem, but I would prefer some means of adjustment. We all know how unreliable shipping companies are in the U.S. The possibility of receiving one of the amps damaged and requiring replacement presents such a problem. Since this actually happened to me, I am sensitive to the possibility, particularly because my pre-amp is dual mono and does not provide a balance control. The evolution of a new series of Power Triodes (Golden Reference Series) with an average life of 8,000-10,000 hours and guaranteed for one year. The evolution of a new Driver-triode, the AV8B. He was not satisfied with the 300B or 2A3 as driver. The evolution of a new, specific, handmade output-transformer. Twelve different ones were auditioned during the three years of development. Power transformers that are coated with a special mass to absorb resonance. They have a high thermal conductivity and are shielded against electrical interference. A circuit designed to provide average throughput thus assuring long tube life. By lowering the current to the anode and decreasing the cathode impedance, the circuit decreases the negative impedance of the grid making the valve more efficient. Hirt went on to say that the amp/speakers are protected against a sudden turn-on transient by the output transformer. He recommends against cables with network filters and prefers that, where necessary, the interconnects between the pre-amp and amp be long rather than the cables between amp and speakers. The amps should not be turned on unless they are connected to both the speakers and the pre-amp. The speakers, bi-wired to the amps, and as is typical in my living room, are nine feet from the rear wall, about 39 inches from the side walls, and toed in toward my listening position. When serious listening begins, I then make adjustments for imaging, focus and depth, keeping in mind the balanced response of the system. All of this is dictated by the dimensions and liveliness of the room which is 15’ wide by 25’ long, with a cathedral ceiling; at the apex it is 9’ high and 5’10" at either end with a 6’2" grand piano at the other end of the room in relation to my listening position. Is This the New Magic Sound? You’ve all heard the old audio cliché, "I was so impressed with the sound that I found myself playing all the records in my collection." Well, I confess, I did find myself playing an awful lot of my records. Perhaps it was the surprising dynamics together with the overall neutrality that had me playing one disc after another. And perhaps it was the search to define the basic difference with the very fine reproduction from my present reference amps. If this were a case of the new amps sounding so much better than my reference amps or vice-versa, it wouldn’t be necessary to do so much auditioning. One thing is for sure – this is one hellava pair of great sounding monoblocks. Would I love to own them? You’re damn right I would. It was all there: the gorgeous mid-range that one expects of tube amps, but neutral, not "swampy"; realistic dynamics and tight bass, unusual in an SE amp; sweet, extended upper treble; and all presented with depth and a wide, slightly forward sound stage. At first, I wondered if this slight forward balance was a minor fault in the amps but switching to some SACD discs and a comparison between the CD master of my original black vinyl indicated otherwise. Also, there was an absence of excess sibilance in certain vocal CDs that I use to check such a problem. It isn’t always easy to determine, when comparing two different amps, which one is correct. I saw nothing in the frequency response that I ran with the Gold Line Analyzer to indicate a hump in the mid-range. The results represented the acoustic response of my living room rather than any basic problem with the system. Because of the WF, I’m somewhat limited in correcting acoustic room problems. In spite of this, the response through most of the range was +/- 2dB from 25 Hz – 10k Hz; there was a plateau at 50 Hz and a dip at 100-125 Hz in my usual listening position (that varied if I changed my seating). I could correct the slight variations with one of the digital correction devices but I’m not happy with what it does to analogue – besides the Sony SCD-1 doesn’t lend itself very well since there is no SACD digital out. I’m not going to bore you with endless comments about the many records, analogue and CD, that I auditioned. 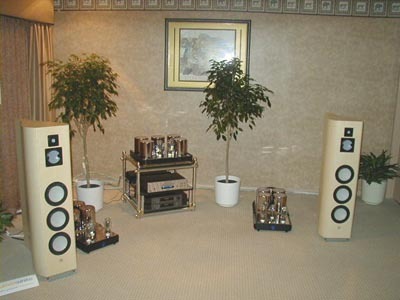 But there are a few that I need to refer to in order to give you an idea of the sound of these monoblocks. Sinatra was not often well recorded, but I found his renderings on The Very Best of Frank Sinatra (Reprise 948589-2) and Francis A. & Edward K. (Duke Ellington, Reprise 1024-2) reproduced as well as I have ever heard them: the right blend of voice and instruments; a mid-range not overly warm as tubes can be; and sound smooth and liquid, but detailed and transparent. Columbia’s SACD version of "One Sweet Day," with Mariah Carey and Boyz II Men from Mariah #1’s (CS 69670), can sound a little raucous and compressed with some equipment. None of that was apparent here. Some of the cuts on this album testify to the Vaic’s ability to handle rock recordings as well as small jazz groups and chamber music. Balanced and neutral yet dynamic and articulate with extended response are some of the hallmarks of these amps. To really get the full measure of a piece of equipment, I usually turn to classical orchestral, opera, large choral groups, etc. An excellent amplifier can usually handle small ensembles – jazz, chamber, etc. – with aplomb, but it takes an outstanding one to reproduce something like Prokofiev’s Cinderella on London 410 162-2. Try cuts 5-12 on the second CD. The Vaic reproduced the exceptionally wide dynamics and exciting bass response without compression or distortion. The cymbals and percussion were superbly detailed and transparent, with outstanding transient response. No, this is not quite what you hear at a live concert, but it is the best of what you can reproduce from a well recorded, multi-miked CD. The bass dynamics of the drums, particularly at the end of cut seven were tight and well-defined without any trace of overhang. It was the sound of a real drum, not the mediocre reproduction of one. I don’t think an outstanding transistor amp would have been more impressive or truer to life! I can’t remember being more impressed with the reproduction of this ballet. The "tick-tock" on cut ten had all the quality of the real thing. It was followed by the fortissimo of the full orchestra without any break-up. The Vaic did not run out of steam – a test of any system. No compression, break-up, distortion or apparent speaker cabinet resonance. My final item is from Offenbach’s The Tales of Hoffmann (London 417 363-2), "Les oiseaux dans la charmille," cut 13 on the first CD. Recorded in 1972 when Sutherland was in her prime, the aria is the most charming and memorable in this most wonderful performance of the opera on record. Sutherland’s glorious voice is at once breathtaking, awesome and stunning. Her voice, huge and with a tremendous range as essential for this aria, requires the best of equipment to avoid distortion, particularly in the high parts. The Vaic simply sailed through, raising goose pimples for this listener. I replayed this cut at the Vaic exhibit at the Stereophile, Home Theater Show on May 11, 2001. My feelings were shared by the rest of the listeners in the room. Recently, my friend Billy and I spent an afternoon at Arne Balgalvis’ listening to his solid state, Spectral/Avalon set-up. Although solid state amps are not my bag, I was quite impressed with his system. One of the cuts Arne played was "Night Train" from Verve’s Jazz Classics, Hot Java Jazz (DPSM 5193). Billy heard this last Sunday morning at my house and was overwhelmed with the near-live sound of the bowing. Here it was, two completely different but excellent systems doing every bit of justice in reproducing the detailed, transparent and realistic life-like quality of McBride’s unexcelled bowing on the bass! The Vaic is an unusual SE triode amplifier, powerful and with realistic dynamics, tight bass, neutral and balanced with extended range, a beautiful mid-range, yet not "tubey" sounding, sweet and liquid but articulate, detailed and transparent. In short, an amplifier that provides the best in sound. Of the finest SET amps I have heard – Cary’s CAD-1610-SE Mnoblocks and KR’s KR VT 850 MK Monoblocks – I must now add the Vaic Reference 52B Monoblocks, THE NEW MAGIC SOUND! Finally, a suggestion. I recommend a gain control to match the input sensitivity of each amp exactly. This would not only allow exact matching but would allow for the difference in pre-amp output voltage which often can vary between .5-2 volts among different units.